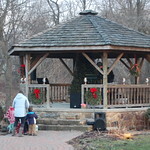 The 2010 Christmas Tree Lighting and Bonfire took place on Saturday, December 18, 2010, at the Kreidersville Covered Bridge. The bonfire warmed us while we sang seasonal carols and enjoyed good company, cookies and hot chocolate. Performing were Sammy Sax and Danny Pany along with our DJ Gene Thrash who played us into the Christmas spirit. These photos were taken by friends of the KCBA, Corrine Santucci and Chad Niebell. Thanks for Corrine and Chad. And thanks to the Allen Township Fire Company for giving Santa a ride when his sleigh broke down.